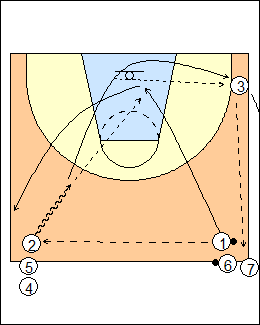 1 passes to 2 and cuts to the basket, 2 takes one or two dribbles and passes to 1 for a no-dribble layup, 1 goes to the passing line, 2 rebounds, outlets to 3 and follows, 3 passes to 7 and follows. A make by 1 counts only if 2 rebounds before the ball hits the floor, a miss by 1 counts if 2 can tip it in. Time it, with target makes or makes in a row. See Layups - Kevin O'Neill, Two lines, Give and go.